Knowing your sewing machine is important, too. Being able to identify basic parts and troubleshoot problems is the way to avoid expensive repairs. Maintaining your sewing machine with basic maintenance procedures is also a way to avoid those repairs and stay productive with sewing. Keeping your sewing machine in good working order is important. Knowing the different parts on your sewing machine can help you troubleshoot problems. A good place to start to get familiar with the parts of your sewing machine is your instruction manual. Each Singer sewing machine manual has detailed diagrams that identify all the parts of a sewing machine and a comprehensive list of the working parts of your machine. 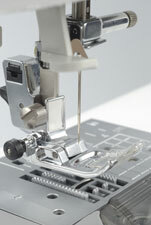 If you cannot find your manual, you can access the Singer Sewing Machine web site to download a copy of it. If for some reason your sewing machine is not working properly, the first thing you should do is to try to identify the problem. Some problems have simple solutions that you can fix yourself, but some problems need professional evaluation and care. For instance, if the sewing needle in your machine keeps breaking the problem may simply be the wrong needle may be in place for the specific fabric you are sewing on. This particular problem doesn’t require maintenance or a repair call; it just needs your attention and care. For continual sewing enjoyment you need to keep your sewing machine in top condition. One way to do this is to keep it maintained. Here are some simple steps to keep a sewing machine in proper working order. Remove lint from your sewing machine as an easy way to avoid wear and tear. Keep your sewing machine properly lubricated with oil to avoid problems. Periodically check for loose screws and tighten them. Missing screws will need to be replaced by an authorized repairperson who will find Singer sewing machine parts to replace these missing items. You’ve determined that the problem is mechanical and you want to fix it yourself. If you’ve determined you’ll need to order parts, there are many outlets for Singer sewing machine parts. Checking online should be one of the first places to start searching for Singer sewing machine parts. You may also want to check to see if there is a local parts source in your area. Sometimes problems can be beyond your ability to repair on your own. This is when you will need to seek a professional repairperson. You can easily find a local sewing machine repair shop by looking in your phonebook or doing an online search. Such a shop can also be a good source of Singer sewing machine parts. Before arranging for a repair, you should also check your warranty to see if the repair is covered.